Treat yourself to a getaway in a true holiday village. Enjoy all the amenities on site for a relaxing stay with ease. The camping club Domaine de Léveno is the reference holiday village in the South Brittany region. From the opening to the closing of the establishment, enjoy many high-end services. Thus, from the Easter holidays or during the holiday weekends of Pentecost and Ascension for example, you benefit from the opening of all shops. A continuous service for maximum satisfaction. The bar of the campsite welcomes you from April to September in continuous opening from 8:30 to 23H (midnight during holidays). The spacious and modern environment of the establishment brings you comfort and relaxation for a successful holiday. With family or friends, come "chiller" and settle on the terrace of Léveno under the sun of the Loire Atlantique. Inside, club chair, round table and cozy atmosphere on one side, eat upright and bar stool for a quick break from the other. Turn your head and enjoy the panorama on the aquatic area ... it’s the holidays! The bar area offers à la carte a large selection of hot and cold drinks, alcoholic or not. You’ll find delicious homemade cocktails right in front of your eyes by our bartenders, a full ice cream menu for the most gourmet and all the traditional drinks ranging from Viennese chocolate to fruit juice. Until 11:00 each morning, a breakfast package is offered, including a hot drink, fruit juice and pastries. It is better to book the day before with your bar team to enjoy. You enjoy free Wi-Fi in the bar area. Discover a real restaurant run by our chef Ludovic, who has the heart to serve you tasty refined dishes and homemade. The restaurant-pizzeria opens every day from 12:00 to 14:00 and every evening from 19:00 to 22:00. An appetizer? In starter, find homemade foie gras, served with gingerbread and apple chutney. Enjoy our "lamb hazel with rosemary sauce" or "flambé gambas with whiskey" in a main dish. For dessert, treat yourself to our "chocolate tart and homemade red berries", the "homemade tarte tatin and its vanilla ice cream" or the diabolical "half-cooked chocolate heart of Nutella". For cheese lovers, let yourself be tempted by the "duo of mini camembert roasted with honey and breaded gingerbread"! A bottle of wine to accompany your meal? Let yourself be guided by our waiters who will take pleasure in describing the qualities of the different bottles selected by our Chef. The tasty dishes cited are examples and not exhaustive. Find a complete menu with all the traditional dishes you know such as mussels, roquefort or curry, a selection of burgers, several compositions of salads, but also the delicious pizzas prepared with all the know-how of Italy. Depending on the period, the restaurant-pizzeria Domaine de Léveno is very busy. In this sense, we strongly advise you to reserve your table. The service in addition to your Camping Club: delivery of your meal directly to your holiday location! This service is offered from 19:00 to 22:00 for any meal ordered with a minimum amount of 15 € per delivery. The restaurant’s bar and restaurant area can be reached on 02 40 24 79 30. Want to nibble or eat on the run. Get closer to the campsite snack bar for a fast food service. Open from 12:00 to 14:00 and from 18:30 to 21:30, you will find pizzas, bagels, paninis, kebabs, salads and other cold or hot sandwiches. As for the delicious dishes of the restaurant, the possibility of being delivered directly to your location is also possible with the "snacking" formula. Service available from 7 pm to 10 pm for all orders over € 15. Open every day from 8:00 to 13:00 and from 17:00 to 20:00, visit the grocery store "Chez mamie Baguette" of the Domaine de Léveno, located in a recent and modern premises. You find inside all the products of the daily newspaper of your holidays at smart prices. No overcosts or disproportionate prices, Capi has decided to offer you all the products of the grocery store at the "supermarket" rate. From April to September, it is a real local business that is available to you, thus avoiding the inconvenience of over-frequenting large stores in summer. A shop that greatly facilitates practical life during your stay. Stroll through the different departments, find fresh vegetables and dairy products, as well as cold cuts, grilled meats, local products and already fresh drinks. A press point is available in July and August. You smell the sweet and pleasant smell of hot bread reminiscent of childhood around the reception of the campsite. It is not a mistake of perception. 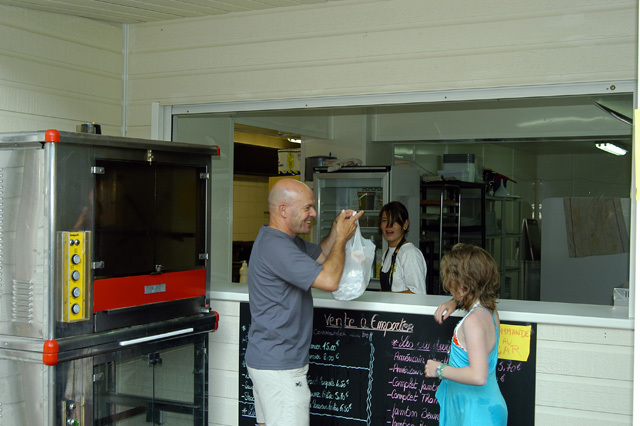 Camping Club Guerande bakes bread and pastries on site each morning. Choose from 2 ranges of baguettes, croissants, pain au chocolat and raisin breads for the whole family. Enjoy your breakfast with hot bread for the delight of your taste buds.